Rye’s Achilles heel remains the presence of ergot in the harvested grain. Ergot is the sclerotium or survival structure of the fungus Claviceps purpurea. Removal of the sclerotia is cumbersome but imperative if the rye is to be used as either food or feed because it is the cause of ergotism or Saint Anthony's Fire. Rye is inherently more prone to ergot infections as it is a cross pollinator whereas wheat, barley, and oats are self-pollinators. Having good seed set combined with genetic resistance to infections greatly reduces the number of ergot infections. Little to no variety development has been done in North America in recent decades. The Samuel Noble Foundation in Oklahoma has continued to develop rye varieties for grazing while Steve Zwinger at the Carrington Research Extension Center has maintained a small breeding program. His work has resulted in the first new rye variety in the region in over two decades with the release of ND Dylan by NDSU last winter. Meanwhile a number of European breeding companies, most notably KWS and SaatenUnion, have developed a system to produce hybrid rye seed. The University of Minnesota reinstated a rye variety performance evaluation in the fall of 2014. Preliminary yield data over two years of trials with both North American and European germplasm shows that not only the grain yield potential differs greatly among the old(er) Canadian and US varieties but that the best hybrid ryes outpace the best North American germplasm by nearly a third. It should be noted that not all of these hybrids are commercially available in the US at this time. 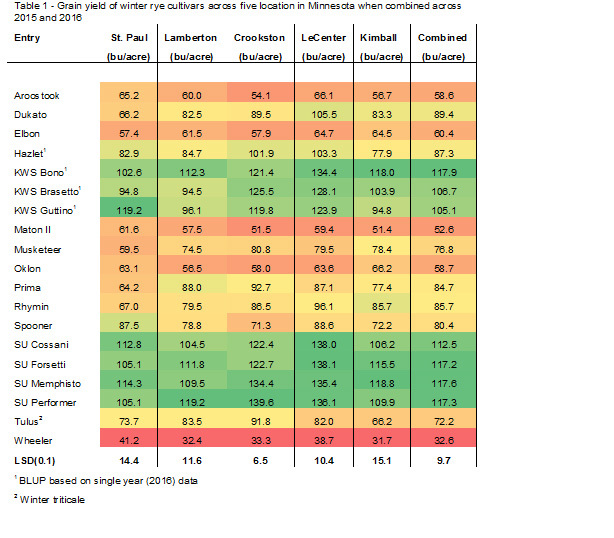 Nonetheless the data does show the potential of rye as a grain crop and not just merely as cover crop in Minnesota.